2. They're often fairly baggy so a GREAT way to hide a food baby after far too much food and alcohol has been consumed (guilty as charged). 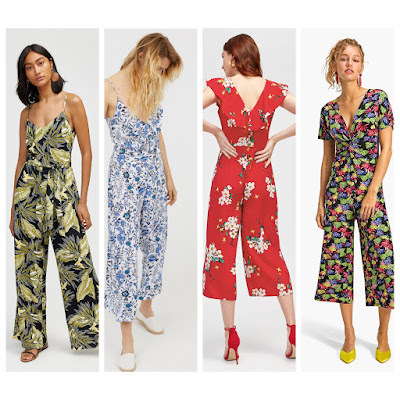 Find me a jumpsuit more chic than this Palm Print Jumpsuit (far left) from Warehouse. The print, the cut, the neckline, the cute little sash... I'm just totally obsessed. It's a great transitional piece that would look amazing dressed down with a pair of Adidas Superstars and a straw bag, but also with some barely there heels and a little clutch. In need of some wedding outfit inspiration? Look no further than a cute, ruffle sleeved jumpsuit. This Blossom Print one from Warehouse is a fab option if you're feeling colourful, but there are so many variations on the formal jumpsuit; whether it's one shoulder, sweetheart neckline or a bardot style. The possibilities are endless! This Culotte Jumpsuit with a knot (award for the most uninventive product name goes to this one) from Stradivarius screams DJ Jazzy Jeff to me for all the right reasons. I just love the neon leaf print that's going on, and feel like this could be a seriously comfy and chill AF piece to rock as the weather transitions from Spring to Summer! The snake print Leather Two Part Sandals from Warehouse on the top right are my personal favourite out of all of these shoes. I love that they have a little ankle strap to stop your foot moving around too much, plus they're only £22 which is an absolute bargain! ( BRB just buying them in every colour). The bottom left shoes are the Light Pink Leopard Espadrilles from H&M and I love the fun colours they've used for these. Plus everyone needs a comfy pair of espadrilles for summer! 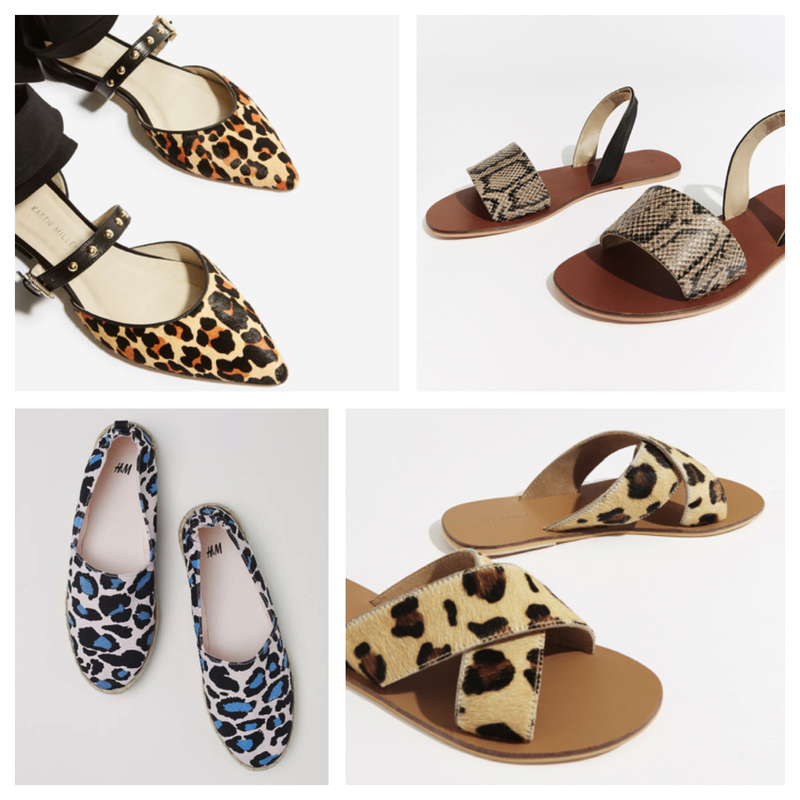 The gorgeous Leather Crossover Sliders in the bottom right are another Warehouse find, and I feel like they're such an effortlessly cool piece, and a staple for your summer wardrobe. Lets be realistic, as excited as I get about summer weather, we do still live in England, so it's always good to have a pretty printed jacket standing by, just in case it does start raining cats and dogs! This sweet Pink Striped Crepe Blazer from New Look is the perfect mix between tailoring and casual. The relaxed silhouette makes this wearable from workplace to after work drinks, and the pink stripes are oh so candy sweet! 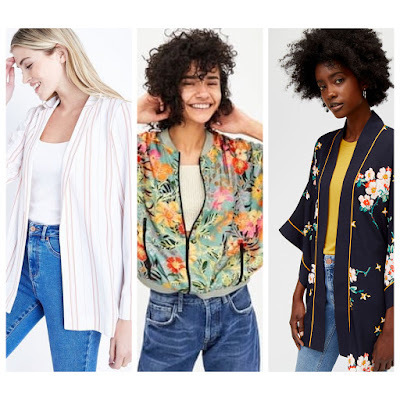 Now when I think of printed bomber jackets, my mind totally goes to Karamo from Queer Eye and his addiction to wearing them. (Side note: isn't Queer Eye the most sweet, touching, emotional and magical programme you've ever watched in your life?!) 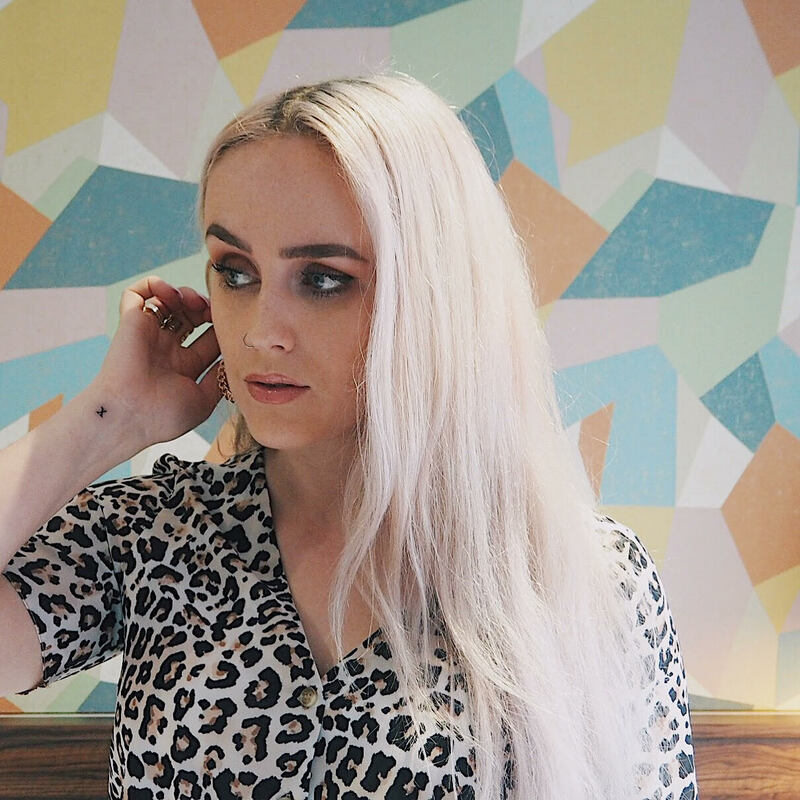 This Zara printed number is so funky and retro, I'm living for it! And I think Karamo would be too. The kimono is definitely a summer staple; whether it's being worn as a light layer, or a pool cover-up. There were about a million and one different styles I could have picked for this category but this Floral Kimono jumped out at me cause of its zingy orange piping and sleek shape. Je t'adore. I love prints, especially in summer, the brighter the better!